Brussels is one of the most fun, overlooked cities in Europe. Both historic and modern, ornate and sleek, busy and quiet, the city has different personalities in only the span of a few blocks. There’s something new and different at every turn, and it keeps prompting us to come back. We’ve visited Brussels three times, and we still feel like there’s more to uncover. 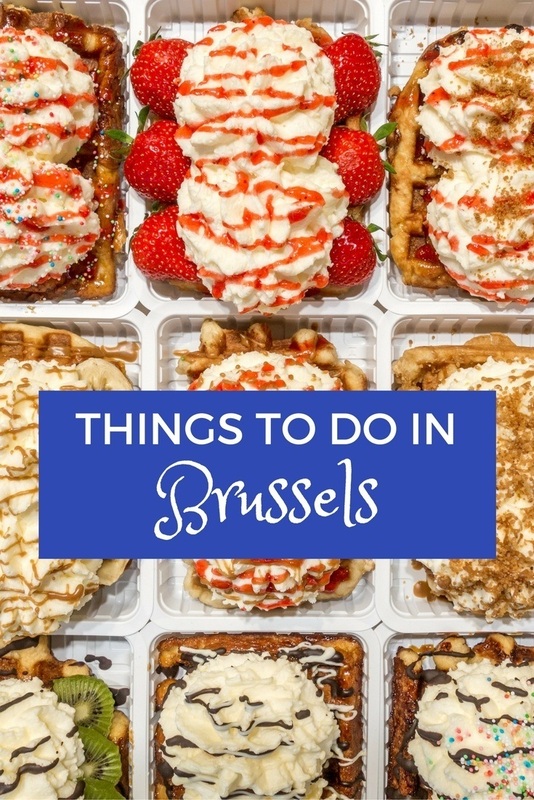 As we pounded the pavement, bused our way through the city, and even climbed high above it, we discovered that there are more than just a few fun things to do in Brussels. Here’s a look at our favorite activities. Cantillon Brewery (aka Brasserie Cantillon) is one of the best places to visit in Brussels for beer fans. 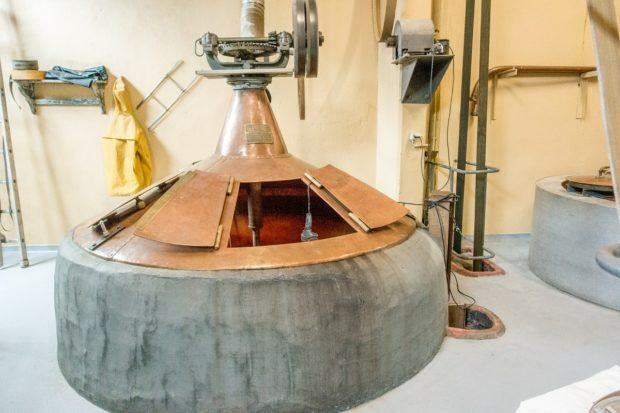 This historic brewery makes only lambic beer, which spontaneously ferments with wild yeast, compared to most beers on the market that have a tightly-controlled fermentation process with specific strains of brewer’s yeast. Founded in 1900, Cantillon was one of more than 100 breweries in Brussels when it began but is the only one that’s still around from that time. That sense of history is clear when you walk through their brewing and bottling facility just outside Brussels’ historic center. A self-guided tour of the Cantillon Brewery–one of the top places for beer fanatics who visit Brussels–takes about 30-45 minutes. As you walk through the factory, you see the brewing, fermentation, and bottling areas. And, of course, there’s plenty of time for a tasting. You can pick your poison from several available products at the bar, but Cantillon is best known for its gueuze and kriek (sour cherry) varieties. We’ve written more in-depth about the tour here. Wondering where to stay in Brussels? You’ll find more details about where to stay in Brussels at the end of this article. When I first gazed up the hill to the Cathedral of St. Michael and St. Gudula, I paused for a second to remember that despite the beautiful building in front of me and the French speakers surrounding me, I wasn’t actually in Paris. That’s how much the Gothic cathedral reminded me of Notre Dame in Paris. A chapel dedicated to St. Michael has been on this spot since at least the 9th century. And although the current version of this stunning building honoring the male and female patron saints of Brussels opened in 1519, it was under construction for 300 years before. At nearly 600 years old, it must be one of the oldest and prettiest things to see in Brussels. The cathedral’s two towers are typical of the French Gothic style (hence the similarity to Notre Dame), and the south tower contains a whopping 49-bell carillon. Inside are gorgeous Gothic and Baroque chapels and plenty of elaborate stained glass windows to lose yourself in, even if you’re not much into churches. Even if you only have one day in Brussels, indulging in a delicious waffle should be at the top of your list. Our favorites (and the ones we believe are the best in Brussels) are at Maison Dandoy. This shop has been cranking out delicious baked treats since 1829, so they know what they’re doing. At many waffle stands in Belgium, the waffles are re-heated, which is no bueno. At their counter and in the tearoom, Maison Dandoy makes everything to order, and the difference in quality compared to those other options is night and day. You can select a sweet, compact Liege waffle or a fluffier Brussels one (there’s actually no such thing as a “Belgian waffle”). Toppings include ice cream, hot chocolate sauce, caramel, and a dazzling array of other sweet things. There are eight Maison Dandoys in Brussels, but we loved the one on Rue Charles Buls where you can enjoy your waffle slowly in the upstairs tearoom. We love street art in every place we visit, so it was one of our top things to do in Brussels. From Canada to Ecuador to Northern Ireland, we’ve sought out political murals and artistic expressions. Brussels takes street art to a different level, actually creating a Comic Book Route that pays tribute to well-known local comic characters and authors. In more than 50 spots around the city, you can find these fun artworks and highlights of Brussels sightseeing. It almost becomes a game to see how many you can locate as you explore Brussels. Ultimately, I think I found 10, mostly in the city center. If the Comic Book Route isn’t enough to satisfy your interest in the comic history of Belgium, stop by Brussels’ Comic Book Museum. There, you’ll learn about the history of comics and how they’re made, and you’ll see some of Belgium’s most famous comic creations—The Smurfs! In Brussels, the love of comics is pervasive. Some spots—like the fabulous Radisson Red Brussels—make them part of your morning, noon, and night in your hotel. At the Radisson Red, we encountered comics from the minute we stepped through the lobby door…and then on our breakfast napkins, in the hallways, and all the way to our spacious suite. The whole effect is light-hearted, energetic, and happy because there’s something fun to see everywhere you look. After all, what are cartoons for if not for making you smile? Undoubtedly, one of the best things to do in Brussels is to visit the heart of the city—the Grand Place, or Grote Markt in Dutch. 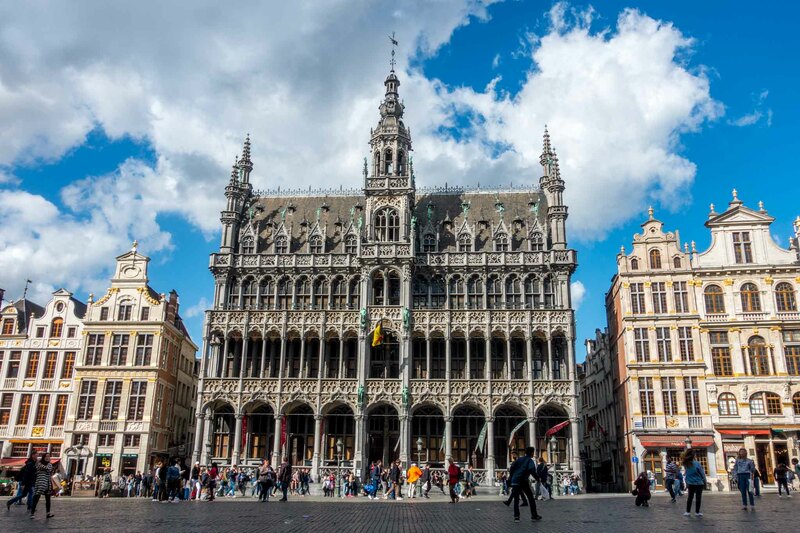 The central square is surrounded by ornate guildhalls, the city’s towering Town Hall, and the Breadhouse that is home to the Museum of the City of Brussels. A UNESCO World Heritage Site, most of the buildings in Brussels’ Grand Place date back to the late 1600s, although there have been buildings here since the 1200s. 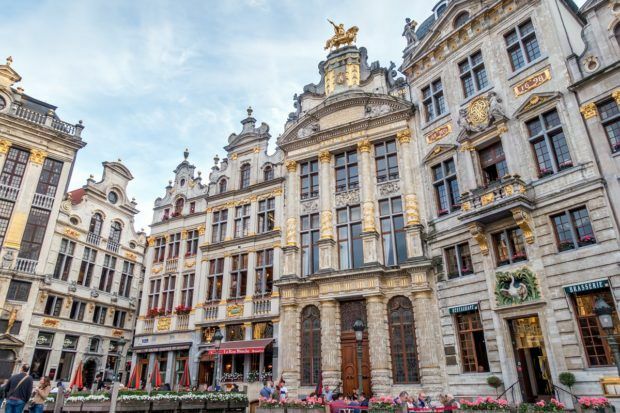 Stepping into the Grand Place, it’s hard not to be overwhelmed by the beauty and size of the lavish historic buildings on all sides of the square. Everywhere you look, tourists are picnicking, chatting, searching for a prime spot for a late-afternoon beer, and trying to fit the tops of the buildings into the perfect selfie. There’s so much to see all at once. It’s definitely worth a visit (or more) on any trip to Brussels. Right off Grand Place is the Bourse, Belgium’s stock exchange that dates from 1873. The building itself is imposing with large columns and lots of sculptures, some of which were done by Rodin early in his career. The real attraction of the Bourse is inside. After standing empty for a decade, the building is now used for special exhibits ranging from photography retrospectives to immersive experiences about everything from the ruins of the ancient city of Pompeii to the work of Vincent Van Gogh. A beer museum, slated to open in 2020, is in the works for the upper levels. Check out a bit of Brussels’ café culture at Le Cirio. This sumptuous grand café dating back to 1886 caters to locals and tourists alike. Inside, you’ll see unique touches like polished brass and artwork from the time the place opened. Outside, you can enjoy the patio and people watch to your heart’s content. I stopped here to give my feet a break and to enjoy the house speciality, a half en half, which is a mix of still and sparkling wines poured perfectly at your table. Just outside the historic city center is a spot of international importance, the European Parliament. Even if you’re not deeply into politics, a stop at the visitor’s center here—the Parlamentarium—is worth your time. An engaging, multimedia exhibit walks you through the World Wars, showing visitors what life was like throughout Europe during war times and explaining the reasons why the European Union was developed (in short: build alliances, improve trade, and give people a reason to care about the welfare of other countries). On your visit that lasts about 60-90 minutes, you get up close and personal with members of the European Parliament (or at least their stories) and watch mini-documentaries about how being part of the EU has benefited regular citizens. Not currently (or unsurprisingly) part of the exhibit: Brexit. I have to confess that I don’t really “get” the Manneken Pis statue, but it’s an absolute must-see for any Brussels sightseeing trip. The 2-foot-tall peeing boy statue is photographed and gawked at all hours of the day by everyone from high school students to businessmen in suits—many posing for a selfie with the famous boy, of course. The statue was originally made all the way back in 1619. So even though it’s a bit odd, it’s quite historic. Manneken Pis has been stolen several times over the years, and the current version dates from 1965. He’s often dressed in unusual costumes, many of which have found their way to a permanent exhibition inside the City Museum located in the Grand Place. Manneken Pis is so famous that two other peeing statues—one of a little girl and one of a dog—have also made their way into the Brussels landscape. Get some chocolate from one of the many nearby stores, and make your way to the corner to join the group of onlookers. The Mont des Arts, or Kunstberg, is exactly as the name says, the “hill of the arts.” In this area that separates the upper and lower parts of Brussels, visitors can experience almost every conceivable artistic activity. There are concerts at Bozar, movies at Cinematek, and fabulous exhibitions at the Royal Museums of the Fine Arts and the unique Musical Instrument Museum. There’s lots to do in this area, but my favorite thing is just to enjoy the view. The geometric garden and the vista it provides of downtown Brussels and the spire of Town Hall is one of the most popular places in the city. Any time of year, you’ll find people lounging on the steps and hanging out on the benches under the plane trees. It’s a peaceful green space to relax in the heart of busy Brussels. With swirling iron, bright exterior paintings, and large windows, Art Nouveau architecture in Brussels is notable for its ornate details and use of natural light. Several buildings just outside the historic center have been recognized by UNESCO for their design. For lovers of decorative art, it’s worth the 15-minute trip to the Saint-Gilles and Ixelles neighborhoods to see the unique Brussels architecture. We’ve loved the fanciful Art Nouveau style since we encountered it in Riga, Latvia, but it varies a bit in each country. Dating from the late 19th century, Art Nouveau was introduced to Brussels by architect Victor Horta whose home and workshop are now the noted Horta Museum, a popular Brussels tourist attraction. In addition to the museum, you can make your own tour of the series of private homes and buildings designed by Horta and his contemporaries. You’ll see brilliant paintings, intricate balconies, and lots of other decorations. The interior of many of the buildings can be visited if you reserve in advance. If you are staying closer to the center, the Comic Book Museum and the Musical Instrument Museum are both examples of Art Nouveau architecture which might be easier to reach. Beer and Belgium go hand-in-hand, so checking out some of the famous beer bars is one of the best things to do in Brussels. Alongside the huge list of beers, there is usually a limited selection of other drinks if, like me, you’re not a beer lover. Some of the most famous beer spots in Brussels include the historic A Mort Subite, which also has a wide selection of food, and Moeder Lambic, which specializes in the lambic style of beer like those brewed at Cantillon, though they sell other beers, too. Poechenellekelder, near Manneken Pis, is also great and has a kitchy downstairs area called “The Puppet Cellar” which we preferred to the upper floor. All three are commonly suggested as among the best bars in Brussels. We also visited the massive Delirium bar, which has 2000+ beers on its list and is easily recognized by its pink elephant logo. The first time I tried to go, it was packed with way too many people for my liking even spilling out into the street. The second time (Christmas Day), there was room to move around. So, know that Delirium is super popular, and plan accordingly, if visiting there is a priority. My sister, the beer aficionado, loved it. Brussels is a busy metropolitan city, but it also has plenty of green space. Since the weather can be a little unpredictable, the whole city comes alive when it’s sunny. One prime place for spending time on fair-weather days is Cinquantenaire Park (Parc du Cinquantenaire). During our visit to the sprawling park, cyclists rode down the paths while families picnicked in the open spaces and visitors lounged around the fountain. The park is also home to the Royal Museum of the Armed Forces and Military History. Not only is the museum itself super interesting, but it’s a great point to access the park’s Arc de Triomphe for views of Brussels. Not far from the Grand Place is Place Sainte-Catherine, a lively neighborhood full of cafes, a market, and its namesake church. One must-visit spot at Place Saint-Catherine is De Noordzee, an atmospheric restaurant and fishbar serving fresh seafood. Stop in for a fish burger or any of their other delicious specialties. If seafood isn’t your favorite, there are plenty of other outdoor cafes to choose from, or you can come back in the evening to check out the nightlife scene that pops up along the quai. Several days a week, you can also visit the food and flower market here that runs all day, but Wednesdays are particularly special when the market focuses on all-organic food from 7:30am-3:00pm. The cornerstone of the area is Sainte Catherine’s Church. Completed in 1874, it’s quite new compared to many other such buildings in the city. Because the church’s architecture draws inspiration from 16th century French churches, there are still plenty of buttresses, gargoyles, and grand statues to be seen. Behind Sainte-Catherine nearly wrapped by a modern hotel building is something you wouldn’t expect to see—a squat, medieval tower. The odd sight has made the tower popular with tourists. With rounded walls and a black turret, the Black Tower dates from the beginning of the 13th century when it was part of the original fortification that surrounded the center of Brussels. For over 800 years, it has survived numerous waves of redevelopment in a part of the city that became an inland port. In the heart of the historic city center, its existence and location are rather improbable. I have a confession: my interest in art is…limited. I know enough to appreciate the works of the masters, but I’m generally not inclined to spend hours in a museum looking at Renaissance paintings and such. But I love pop art, surrealism, and the like. That’s why the Magritte Museum was at the top of the list for our first Brussels visit. From vanishing faces to pig men to all the apple artworks you can imagine, the museum displays 200 original Magritte works. 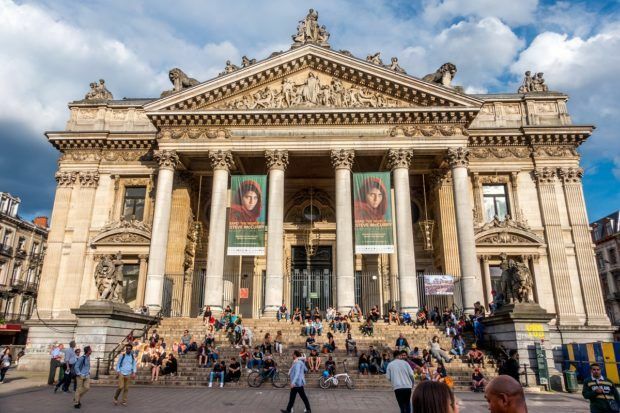 It’s part of the Royal Museums of Fine Arts of Belgium, which also includes the Old Masters Museum, the Modern Museum, and others, in case your artistic tastes don’t match mine. When I first saw the Jardin du Petit Sablon—a beautiful park tucked away in the middle of a long block—I did a double-take. I was on a bus zooming by the Brussels sites, but I knew I had to go back to find that park. When Lance and I returned, we were enthralled by the manicured garden, the fountain, and the statues. I spent at least 20 minutes just sitting and staring, lost in the peace of the quiet space. Even in the midst of a busy trip to Brussels, I highly recommend taking a few minutes to breathe deeply and enjoy the surroundings. Across the street from the park is the Church of Our Blessed Lady of the Sablon (Église Notre-Dame du Sablon), a 15th century church visited for hundreds of years by the nobility and wealthy citizens of Brussels. At other spots in the neighborhood, you can see modern art and sample some of the city’s best chocolate. When you’re done there, browse an antique store, stop for a coffee, and just enjoy. Most people associate Belgium with waffles, frites, and beer. And there’s good reason for that—they’re everywhere, and they’re excellent. But Belgian food goes beyond these snacks and sips to some really delicious specialties. Branching out to try some traditional Belgian foods is one of the top things to do in Brussels. There’s waterzooi, a creamy stew using eggs and butter that usually features fish or chicken. If you like seafood, the moules frites are an authentic, can’t-miss dish. we also discovered a love for stoemp. This Belgian staple blends mashed potatoes with vegetables like carrots, onions, or brussels sprouts and is usually served as a side dish or as an entrée with sausage or other meat. My favorite Belgian find was carbonade flamande. A dish similar to beef bourguignon, carbonade is slow cooked in Belgian brown beer until the meat nearly falls apart. It’s earthy, filling, and delicious. And as a bonus, it’s typically served with frites, so you get two tasty Belgian foods in one dish. Brussels at Christmas comes alive with holiday spirit. Throughout the historic center, there are markets with chalets decked in lights, decorations, and tons of Christmas trees. The greatest amount of activity is around the Bourse and Sainte-Catherine, which seem to merge into one massive market. All around, there are vendors selling gifts and candy and others serving vin chaud (hot mulled wine), oysters, champagne, and filling plates like a potato-based dish called tartiflette. Every year, a different country is celebrated, and Brussels features its food and Christmas customs. There are lots of other activities alongside the markets. There’s a skating rink and dramatic light shows at Grand Place and Sainte Catherine that draw big crowds every night. The concerts, parades, and other special events mean that there seems to be something festive happening all the time. Brussels is ideally located for day trips in Belgium because you can reach lots of different places in an hour or less. 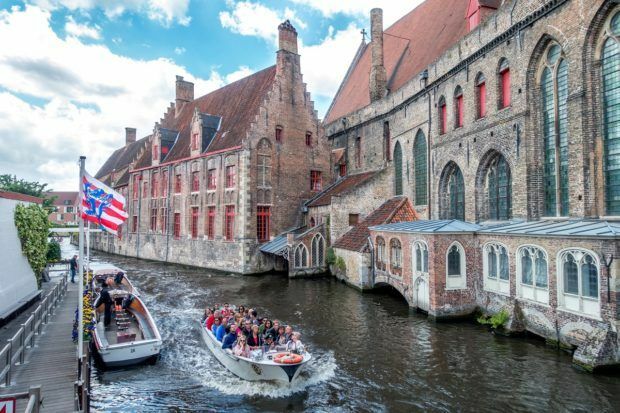 Take a canal cruise and gawk at the merchant houses in Bruges or fall in love with the Town Hall and drink at the world’s longest bar in Leuven. In Antwerp, you can see the workshop of Peter Paul Rubens and visit the world’s only UNESCO World Heritage museum. In Ghent, you can see the city from the belfry, fall in love with all the gorgeous towers, and be back in Brussels by bedtime. If you’re trying to decide between some of these gorgeous destinations, we’ve written about choosing Bruges or Ghent here. Warwick Brussels–Three blocks from Grand Place, the Warwick Brussels is close to all the main tourist attractions but just far enough away to keep noise to a minimum. One of the top-rated hotels in Brussels, the Warwick Brussels offers high-end amenities with top-notch service. NH Collection Grand Sablon–The NH Collection Grand Sablon is located in one of the nicest neighborhoods in Brussels. The hotel offers an excellent breakfast buffet and on-site restaurant plus many other comforts to make you feel at home. Radisson Red–Fun, spacious, and full of personality, the Radisson Red is a great option in the EU quarter. With modern amenities and great food and wine, you’ll have everything you need at this budget-friendly hotel. See our full article about where to stay in Brussels for more information about neighborhoods and additional hotel recommendations. The center of Brussels has lots of great restaurants. We had our fill of Belgian specialties and branched out to other cuisines, too. Lyly’s Fondue–Consistently listed as one of the best restaurants in Brussels, the food is great, and the price is super reasonable for what you get. We tried both the cheese fondue (minimum 2 people) and the fondue bourguignonne and were blown away. The decor looks more like an Asian restaurant than a fondue spot, but, trust us–they know what they’re doing. Reservations recommended. Winehouse Osteria–This 20-seat restaurant serves up flavorful Italian just a few blocks from Grand Place and the Bourse. Almost all the ingredients are imported from Italy, and they have a selection of vegetarian, vegan, and gluten-free options. Reservations recommended. Fin de Siecle–This busy Brussels mainstay serves large portions of Belgian classic foods. From sausage and stoemp to rabbit in kriek beer or vegetarian lasagna, there is enough on the menu to please most palates. On our first trip to Brussels, we were the guests of the Radisson Red. As always, all opinions of the fun, fascinating, and delicious are our own. Note: Some links may be affiliate links, which means Travel Addicts may earn a few pennies if you buy something–-at no additional cost to you.